The Knights Hospitaller, also known as the Knights of St. John, were established following the first Crusade to protect and treat Christian pilgrims in the Holy Land. 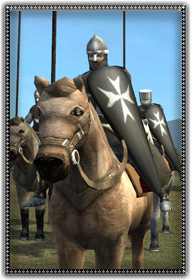 They are recognizable by their black surcoat with a white cross./n/nThe Brother-Knights rank amongst the highest of their soldiering-hierarchy, men to whom their vows to the brotherhood of the Knights of Saint John are most sacred and will entirely be willing to lay their lives down for the cause of God. They wield lance and sword, dressed heavily in mail armor with kite shield and though not possessing as irresistable of a charge as the Templars, serve with greater devotion, inspiration and discipline than the more irregular bands of crusading volunteer knights.